The inflation rate in November predictably slowed down to 6 percent from a nine-year high of 6.7 percent in October. The November figure suggests that inflation clearly plateaued last month due mainly to the slower increases in food and fuel prices. Bangko Sentral Governor Nestor Espenilla Jr. is confident the inflation rate is heading back to the 2-percent-to-4-percent target range, citing “decisive non-monetary measures to curb food prices as well as favorable recent developments in highly volatile international oil prices.” He referred to the earlier directive of President Rodrigo Duterte to the National Food Authority to release all its rice stocks nationwide starting in September as well as the move to import more rice. 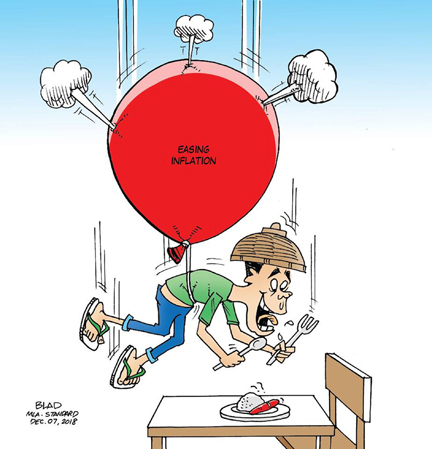 Food inflation, which includes that of rice, slowed to 7.7 percent in November from the previous month’s 9.2 percent, as the supply of key agricultural commodities, such as rice, fish and seafood, meat, vegetables, corn and fruits improved. Falling oil prices in the world market also helped a lot in pulling down the inflation rate. The December inflation data should further reflect the sharp drop in the pump prices of gasoline and diesel, as well as the decrease in transportation fares. Speaker Gloria Macapagal Arroyo, meanwhile, welcomed the drop in the inflation rate. She noted that authorities should have increased the rice supply immediately because the inflation problem was obviously being caused by the shortage of the commodity. Much has to be done, however, if the government wants to effectively lick inflation. For one, the Rice Tariffication bill in Congress, while assuring the ample supply of the staple, should be accompanied by measures to strengthen the country’s farm sector. The government should invest in farm mechanization and adopt the latest technology in crop management that includes the utilization of high-yielding and resilient crops to improve the productivity of the agriculture sector. A strong and modern agriculture sector will lead to improved production and avoid the supply shortage that led to the recent spike in inflation.